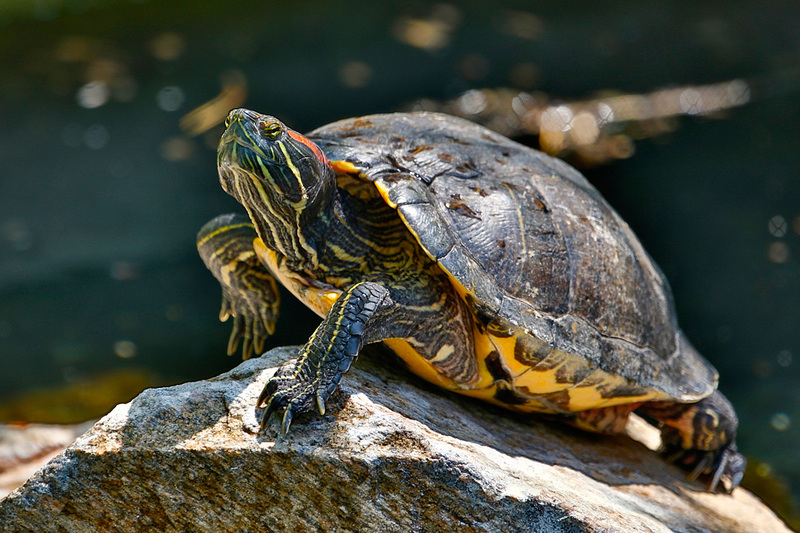 Red-eared sliders are brightly marked and are sometimes mistaken for the Western painted turtles. One difference between the two is the top shell (carapace). The Red-eared slider’s carapace looks like a bowl turned upside down and is divided into “scutes” – instead of a smooth shell, they look like they have separate plates stuck together to form the shell. The scutes are outlined in yellow, and there is a red ear mark located just behind the eye. The head, neck and legs are greenish with yellow stripes. The bottom shell (plastron) is yellow with a dark, rounded blotch in each scute. Females have longer claws on their front feet and can grow as large as 12 inches long. Males are slightly smaller than females. Red-eared sliders get their name from the red mark near their ear and the fact that like to slide off rocks and logs into water. They are sometimes called slider turtles. They lay in the sun in groups on rocks, logs or fallen trees. The sun warms them and helps rid them of parasites. They are less active in winter but do not hibernate. Reptiles brumate, so they spend their time in winter on the bottom of their pond or lake and come out to sun themselves on bright days. They are very sensitive to cold temperature. They live in ponds, lakes, marshes and in slow-moving rivers that have soft, muddy bottoms. They live in fresh or brackish water. They also need to be able to climb out of the water and get warm in the sun on rocks or logs. These turtles are native to southern climates including the south-central United States and range from West Virginia to Illinois. However, because they have been popular in pet stores over the years, the range has spread throughout the world due to humans improperly releasing them into the wild. They are considered one of the 100 most invasive non-native species in the world. Omnivorous. Eat mainly aquatic plants and small animals, such as crickets, fish, crayfish, snails, tadpoles and worms. Turtles don’t have teeth; they chew using the horny ridges that have little sharp groves, like a serrated knife, on their upper and lower jaws. Up to 70 years in the wild and up to 40 years in human care if looked after well. Predators include raccoons, otters, foxes and other medium-sized animals. They will eat turtles or turtle eggs. Turtles slide into the water when they feel threatened but if they can’t get into the water fast enough they pull their head and legs into their hard shell for protection. Breeding season is from late spring to early summer. Females dig nests with their hind legs between 3 and 4 inches deep and around 650 feet from the water’s edge. They dig the nests in soft, sandy soil with lots of sunlight to keep their nest warm. Between 2 to 30 oval, soft shelled eggs will be laid at one time. Females are born if the nest is warmer than 80 degrees Fahrenheit. Otherwise, the baby turtles will be males. They hatch from eggs in 2 to 3 months, looking like fully-formed adults. Stable. Predators include raccoons, otters, foxes and other medium-sized animals. Come and visit this species in the aviary turtle pond at the Zoo.